It isn’t always easy finding the purrrfect gifts for your pets. With so many cool products available, how is a pet parent to choose? To make shopping for your pets a little easier this holiday season, I wanted to share some of my and my pets’ favorite gift ideas. As you can tell from my Facebook page, I love dressing up my photogenic Boxer. If he wasn’t embarrassed enough, ©Ruff Ruff and Meow now make a line of pet and human clothing so he can wear the same clothes as his pet mom! 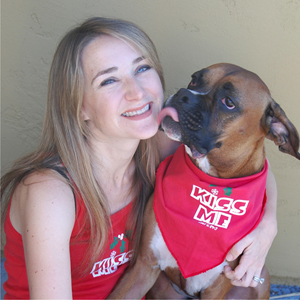 Ruff Ruff and Meow has fashionable tank tops and bandanas for dogs and the humans that dress them. Go to their website, www.ruffruffandmeow.com, to find out more and see their selection. Oski loves to go on walks and he likes to look sharp. Whenever he wants that “GQ” look, he wears his matching collar and leash from Hartman & Rose. They have an extensive selection of fashion-forward collars and leashes for today’s fashionista pets. And when he wants to go for the hip look he wears his fancy collar from Hollywood Collars. To browse these collections, go to visit www.hartmanandrose.com and www.hollywoodcollars.com. Oski understands that sometimes practicality trumps fashion. When hiking at the beach or in the mountains, nothing beats the Water Walker™ leash from The Refined Canine. Besides being a retractable leash that lets him explore, it contains a built-in water bottle and water bowl. It also holds waste disposal bags (i.e. poop bags) so you’re never caught empty-handed. Find it at www.therefinedcanine.com. Elf’s name should have been Peter Pan because he’s my mischievous 2-year-old Devon Rex that never grew up. So I’m not surprised that his choice for the purrrfect gift is a toy. Like most cats, Elf loves laser pointers. Unfortunately, he never seems to get tired and wants to keep playing even after I’m pooped. FroliCat™ has come up with the perfect solution. Bolt™ is an interactive laser toy with an automatic mode that entertains your cat by directing laser lights randomly. If your cat eventually gets tired or bored, it will turn itself off automatically in 15 minutes. Bolt™ not only helps bring out your cat’s inner kitten, it keeps them healthy by promoting active play. Just remember not to shine it in your pet’s eyes and keep it away from young children. Learn more at www.frolicat.com. As my oldest (and wisest) cat, Ling understands the value of a good nap. That’s why he chose The Refined Feline’s Catemporary Cat Castle™ as his holiday pick. The Catemporary Cat Castle provides the perfect place for an afternoon nap. It also has plenty of room for my other cats to play, climb, or hide. Known for making attractive cat furniture, The Refined Feline has a wide selection of stylish cat towers, cat beds, scratching posts, and cat shelves. Go to their website, www.therefinedfeline.com, to see their selection. Why should Oski be the only fashionable pet in the family? Starlite doesn’t think so, that’s why she chose a high fashion collar for her holiday pick. Hollywood Collars has a wide selection of fashionable collars for your pampered cats and dogs. My daughter had great fun picking a cute collar for her fashionable feline. What makes the perfect stocking stuffer for your pet? Oski likes getting something fun, like a dog toy. His favorites are Kong™ chew toys. How can you go wrong with a toy that allows you to stuff it with yummy food treats? Kong™ chew toys are good for their teeth and gums and helps keep them entertained. Dogs love trying to figure out how to get to the treats and enjoy the rewards of their persistence. And for my cats, what’s better than an entertaining and engaging DVD made just for your cat’s viewing pleasure? Pet Acoustics’ Cats See and Play DVD features music and eye stimulating video guaranteed to have your cats entertained for hours. For more info about these stocking stuffers go to www.kongcompany.com and www.PetAcoustics.com. I love being active with Oski and taking him to the beach or mountains, but I don’t like that doggy smell. That’s why I chose Aroma Paws™ Lavender Chamomile Shampoo and Conditioner in One as my holiday pick. It comes in a variety of scents, but I really like the lavender scent because after a bath Oski smells like a day spa. Aroma Paws™ has a wide selection of chemical-free all natural pet grooming products. Check-out their website to find-out what else they offer: www.aromapaws.com. My choice for my favorite gift is obvious to anyone who has an indoor cat and hates scooping litter. As the parent of three cats and two kids, I feel I have changed enough diapers and scooped enough poop to last 5 lifetimes. While the only silver lining for the human kids is waiting till they’re potty trained, there is an immediate solution for my feline kids. Automatic litter boxes do the scooping for you. My two favorites are The Litter-Robot™ and ScoopFree™ automatic litter boxes. Both keep the litter box clean by automatically removing waste after each use. But I’m not the only fan of an automatic litter box because I know my cats love having a litter box that’s always squeaking clean. Learn more at www.scoopfree.com and www.litter-robot.com.